As is tradition around here, each week Gameunculus brings you information about the hottest crypto games in town. This time around, however, he pulled some favors in order to write the most bedazzling and snazzy Gameunculus’s Choice yet. Today we are covering the best selling NFT projects of the past week: CryptoKitties, Decentraland, and Axie Infinity. All the information presented here by courtesy of nonfungible. So without further ado, and if I may… drumroll please? … Voilà! Not much of note happened in the Crypto Kitties camp during the week, so there are no big ups to be expected in their data. However, just after the week ended, they announced that the last Gen 0 Kitty will be born on November 30th. This is interesting to say the least: Gen 0 Kitties will become much more valuable now. Crypto Kitties never disappoints, and this week was no exception. They topped the rankings, selling $114,947 in total. Not too shabby for a bunch of randomized tokenized Kittens! Gen 0 Kitty #520 became the belle of the ball on November 23rd when it sold for 10.5 ETH, or $1,257.90. It’s low ID (#520), generation (Gen 0) and quick cooldown speed for breeding are this Kitty's most attractive features. Its cattributes are nothing to be ashamed of either, as its most common cattribute (Granitegrey color) is present in only 16% of Kitties, and its rarest one (Ragamuffin body) can be found in only 7% of Kitties. Whoever bought #520 is bound to breed some fantastic Kitties. Considering that the average Kitty was bought for only $25.734, #520 better improve the amount of likes you get on Instagram. Decentraland is an exciting project. Its 40,000 followers on twitter are living proof that many people are eager to know what’s up. This is why, even though there haven’t been many updates in the last few days, people are still actively involved with this game. Though lower than Crypto Kitties’s, Decentraland’s sales profit this week is still very respectable. Any NFT project would die to make $86,935. Maybe that’s why they die so often? Lightning struck twice on November 23rd: that was the day when Decentraland landed its biggest sale of the week as well. The -12, 2 parcel of land, adjacent to a road and only two parcels away from a Genesis Plaza, was sold for 200 MANA, which translates to a whopping $11,883.02. 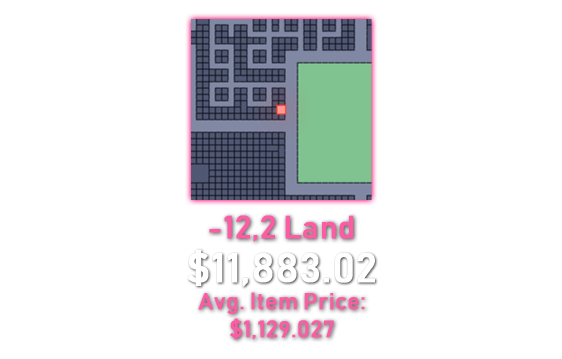 This may not come as a surprise, though, as the average item price in Decentraland was $1,129.927, quite high when compared to the others. It is important to consider, however, that this exact patch of land was bought for the first time in January, for $30,160.33. Ouchie. Our last choice of the week are the cute monsters of Axie Infinity. These adorable creatures have been on a roll lately, thanks to the interesting developments that are taking place in their universe. For one, their alliance with Decentraland earlier this month can mean nothing but good things for the Axies. The same goes for their appearance in Chibi Fighters, which just released their PVP update, meaning that things are just going to keep improving for Axies. 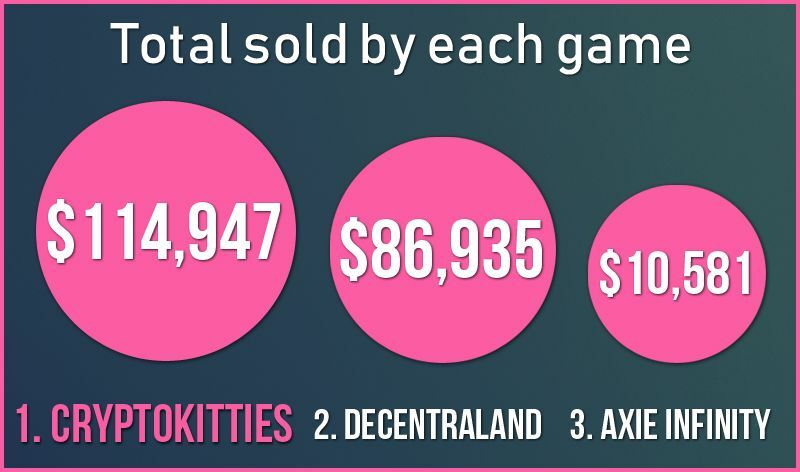 Their partnerships with other popular crypto games are a key factor in their success, and even though they still don’t hold a candle to Crypto Kitties or Decentraland, making $10,581 is absolutely nothing to be ashamed of. Maybe a couple of months down the line we could see Chibi Fighters giving the bigger dogs a run for their money. 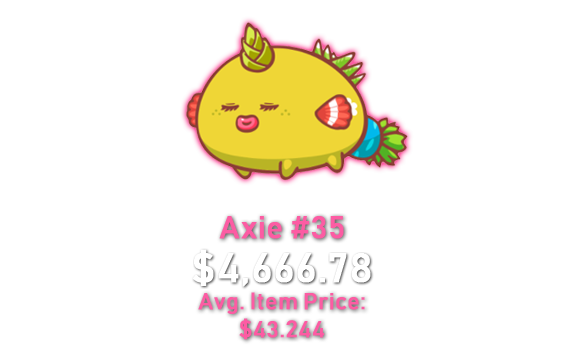 The best selling Axie this week was bought for 45 ETH, or $4,666.78, because it has Money written all over it. It being an "Origin" Axie (sold during the pre-sale) is more than enough to get you excited, especially considering that this Axie has FOUR Mystic parts (out of the 600+ Origin Axies that are available on the marketplace, only THREE have four mystic parts). Dreamy Papi eyes? Red Nimo ears? Namek Carrot tail?! Boy, where do I sign! That wraps up our fourth installment of Gameunculus’s Choice, our weekly pick for the hottest crypto games out there. Do you have any feedback? Do you want us to talk about a specific game next week? Then the best course of action would be to chat with us on our Telegram chat and our Twitter!